Status : complete, exhibited at the workshop, private collection on loan. The Fabrique Nationale of Herstal had a famous department of motorcycles before and after WWII which also developed their owns engines. An aircraft engines department was created early fifties to built the engines that powered the new jets of the Belgian Air Force and this was the start of a new venture in the FN history. In january 1959, this department suggested at the belgian aeronautical technical services ( SMV) to study a small engine of low power for light aircrafts. 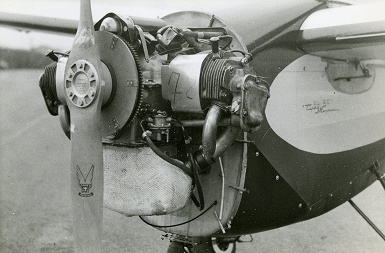 The SMV suggested to contact Avions Fairey at Gosselies because they needed such an engine to power their Tipsy Nipper. The collaboration was fruitful and first test flights were done in october 1960. A small serie of prototypes was realised for trial runs and the engine was certified CAR 13 in august 1962. Unfortunately, Avions Fairey had to produce the F-104G Starfighter and the Nipper production was sold to a new company. 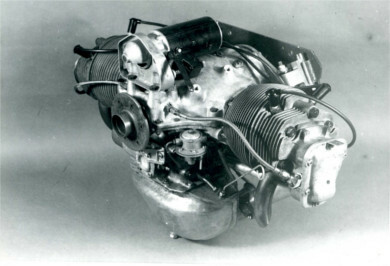 Some vibrations problems had yet to be resolved and the foreseen market was not so promising so, in may 1963, FN decided to postponed indefinitively the AL.2 and its four cylinders version AL.4. The B.A.P.A. example was saved from scrap by a collector who sold it to one of our member.